The American message is clear: ”The US will leave al-Tanf crossing and abandon north-east Syria in al-Hasaka and Deirezzour as soon as possible. The only condition is for Russia and Syria to guarantee a total withdrawal of all Iranian forces from the Levant. The US is ready to leave the Kurds and let these continue their negotiation with Damascus. The US establishment will recognize Assad’s authority over Syria but Iran must leave”. ​Bibi Netanyahu has very recently met with both Putin and Trump ahead of summit. 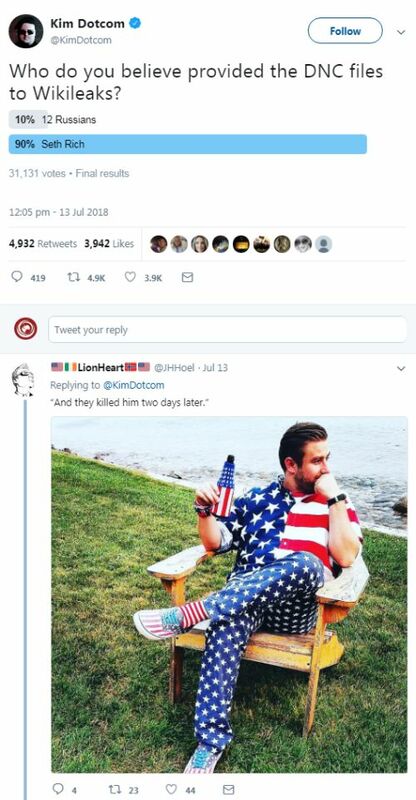 Seth Rich, who is pictured here a couple of days before he was murdered after partying with other DNC staffers and one of those Alawi brothers in a bar. Trump has no policy in Syria. He has been drifting along following donor pressure to accept Israeli policy that is driven by unreasonable tribal fears. He is a pragmatist and deal maker. The R+6 has pretty much won the the war against Israeli/American/Saudi backed jihadis and the ever elusive unicorn semi-jihadis of the FSA. Trump knows when it is time to cut your losses. "You gotta know when to hold'em. Know when to fold'em. Know when to walk away. Know when to run ..." He knows. China has been preparing for a trade war for more than a decade. The light cast from this angle makes sense of Chinese monetary and financial policies which had seemed naive and ill advised in the light of their usual presentation. I wonder what (if any) analysis is correct. Thanks Tom/Regionswork. I am honored. I think we share the same work/calling. The painting you use as "avatar" is on Donovan's Cosmic Wheels album, which I have always liked. Sorry to reply so late. We had a busy wedding and family reunion in Colorado and i was offline for 3 days. Oooh, that's a long time in bit-years. Thanks John. Use of the avatar came from a need to demonstrate the relativity of a boundary and its crossing, making one side local, the other regional. It appeared in morning thoughts, as inspiration often does, at some point in 2013. How about a direct email to Tom.Christoffel (@) gmail.com so we can communicate directly. Web: What are “community motive” & “cooperation industry earth”?